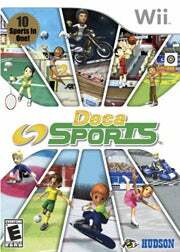 DECA SPORTS, Hudson's take on Wii Sports with added Adidas advertising, may not be a very good game, but since when does that matter. The game is a hit! Developer Hudson Soft has announced that it has shipped 2 million copies of the game worldwide since it launched last spring. Like Wii Sports, the game has players compete in various sporting activities by swinging the Wii Remote around and whatnot. However, it includes many sports not featured in Wii Sports such as archery, badminton, basketball, beach volleyball, curling, figure skating and super-cross.